Whether you’re flipping channels at home or watching one of those mounted TVs in a waiting room, your Android phone can tell you everything you want to know about the show that’s on—what it’s called, who’s in it, what it’s about, you name it. 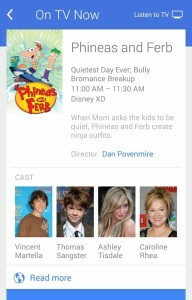 Once your Android phone “listens” to your TV, it can display the name of the show that’s on, episode details, a cast list, and more. 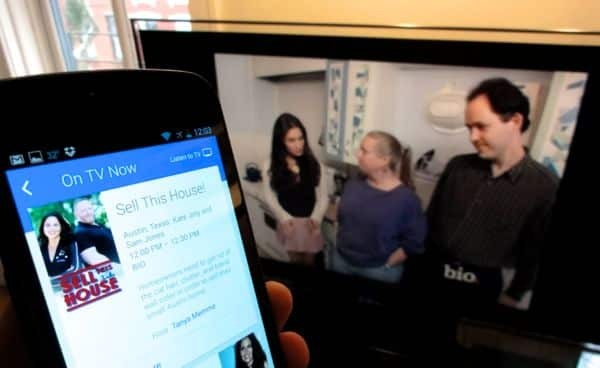 All you have to do is ask your Android phone to “listen” to the sound from any nearby TV set. So, are you near a TV set with the volume turned up? Just tap the little microphone icon in your phone’s main Google search bar and say “Listen to TV.” Don’t want to speak? Then type “what’s on my TV” in the search bar and tap the Search button. Next, hold your handset within about six feet or so of the TV. There’s no need to be right next to the speaker; indeed, I tried from across the room and it still worked. If all goes well, you’ll see a pulsing sound bar labeled “Listening to TV”—and within a few seconds, an “On TV Now” screen should appear, complete with the name of the show you’re watching, a cover image, episodes and TV channel details, a cast list, and (depending on the show) related news articles, web pages, and YouTube videos. Neat.